A number of us from UMBC have been working with partners from across Baltimore–artists, civic leaders, and faculty, staff and students from local colleges and universities–to plan for the Imagining America conference (October 1-3, 2015). Imagining America supports creative work in the arts, humanities, and design fields to advance diversity, inclusion, and democracy. We’re thinking about themes and locations for conference activities that will engage participants from across the U.S. in Baltimore’s stories, challenges, and innovations. Perhaps [the most central theme] is that the city we have, and our experiences in it, can be understood as socially designed (versus inevitable or accidental). Both responsibility and potential are revealed in this understanding of social design. Are such designs artifacts of, and also contributors to, culture, and if so, in what ways? Also voiced was a consistent desire and need to see through our present day systems and circumstances to the history from which they evolved. For example, when we talked about categorization, red-lining, or gentrification the discussion was coupled with stories about Baltimore as a point of origin not only for Star-Spangled Banner and the Civil War, but early railroads and nationally-recognized writers, the intentional and codified segregation of communities, and even the pseudo-science of phrenology. Our harbored and central location on the East Coast made us a transportation and industrial nexus, a key port in the slave trade and builder of its ships, and perhaps as a consequence, a contested, dynamic, elusive border that both divided and included North and South, Black and White, free and slave, rich and poor and the cultures of immigrants. Also in our history are innovators, leaders, and creators of justice and hope such as free Black businessman and labor leader, Isaac Myer and his shipyard; courageous protesters and organizers; and innumerable other iconoclastic figures from Poe and Mencken to Holliday, Shakur, Simon…Real News. Our layered complexity can be illuminated and made valuable to citizens through the work of the arts, humanities, design, and social sciences. Race runs through everything: politics; crime; the geography of neighborhoods; transportation; socio-economic divisions; injustice; displacement; all levels of education including the school to prison pipeline; employment; the arts…To quote J.C. Faulk at the most recent Art-part’heid meeting, race is a constructed illusion, whereas racism is very real. The cycle of boom and bust took Baltimore from being an industrial mecca to a recent example of de-industrialization and the nationwide challenge to find an economic plan that serves everyone but leaves us less vulnerable than in the past. What is that plan? We have assets that include an innovative brain trust, makers, culture workers and community scholars that could make us a leader not only in technology and medicine, but in addressing the problems of our time and releasing our potential. However, though as a whole, Maryland’s schools, including arts programs, are among the best in the nation, the state of education in our city—often arts-less risks the future of Baltimore’s youth—particularly Black and underserved youth. Powerfully encouraging is the fact that Baltimore’s youth are finding their voices and agency in protests, poetry, and filmmaking… Organized efforts such as the Algebra Project, Urban Debate League, Leaders of a Beautiful Struggle, and numerous community arts organizations including the Youth Resiliency Institute, Dew More Baltimore, New Lens, Viewfinders, Wide Angle…and many more, all contribute to a growing sense of democratization that starts with citizens often still too young to vote. In recent years, the arts have flourished in Baltimore for some, but not all residents . Why? As with our neighborhoods, educational achievement, and socioeconomic status, the divisions between the “haves and have nots” in the arts appear to be racial. Interestingly, Baltimore is home to a disproportionate number of social practice artists. There is a powerful sense here that the arts may be able to make progress where laws, institutions, technology, medicine, and high stakes testing have failed. But how does it work? How do we understand or measure the change the arts bring? Are all arts-making intentions equally beneficial? What are the factors that contribute to the rise in Baltimore’s social practice scene? What is the current and potential role of colleges and universities? Should researchers and students restrict their civic engagement to the neighborhoods in which they actually live? What does, say, critical participatory action research (CPAR) really look like on the ground when it’s working? And what about the impact of foundations and non-profits, and what provides these groups the social license to intervene in places where they are inclined to do so? What is Baltimoreans’ relationship to the natural environment of Baltimore? What does nature mean in the context of our city? 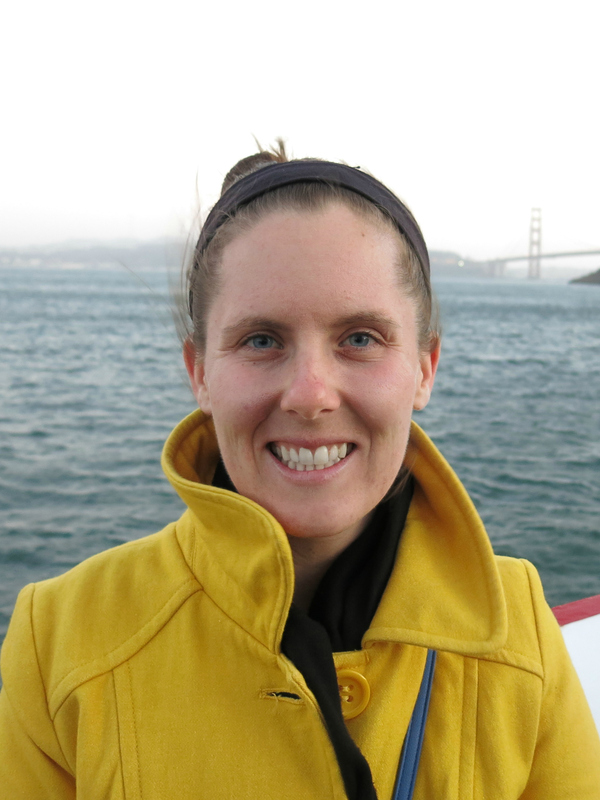 How important is the bay—what we put into it, and what we get from it? How are green spaces valuable, and to whom? Who cares about them? Who uses them? Where do we get our food? Who can get what food where? Are urban farms a long-term solution to affordable nutrition? How much control do we have over our food, based on our circumstances? This list is far from complete, but it’s a start. In its remaining spring meetings, the Baltimore Organizing Group will continue to identify gaps in this list and develop plans for a rich and productive conference that provides attendees with access to the heart of our city’s challenges and potential. Scott Murdock, ’08, Psychology, also known as his drag alter-ego Shaunda Leer, is a lifelong Baltimore resident. [A version of this post originally appeared on Facebook on April 28, 2015]. I am the child and grandchild of policemen, both of whom worked in Baltimore City and more. There were nights as a child that I feared for my father’s safety. I knew he had a job to do. I just wanted him to come home. I also grew up not being “black enough” for some and not “white enough” for others. I never fit in. I never wanted to. I never wanted to be “enough” of anything but myself. To this day I hear those words but I’ve grown to let them roll off my back. The truth of the matter is I wanted to spread love to everyone I met. I’ve always been that way. I always will be. I grew up in Baltimore. I knew it wasn’t perfect. We are a rare breed of a city. We are a rare breed of people. I have seen the beauty in it. I believe I have now seen the ugliest of it. This city, Baltimore, is my home. I grew up believing I may be able to make some difference in it somehow. I did not know how. I did not care. I just wanted a chance to do so. Over the past few days, these thoughts (and more) have surrounded me in a complicated mass of confusion and uncertainty. But I chose to wait. I chose to wait because I knew the beauty that exists in my city. And today, more than ever, I saw it. I saw libraries open because the staff knew these children needed the opportunity to still learn and educate themselves. I saw communities band together to form human shields protecting those attempting to keep peace. I saw neighborhoods form committees to clean up the massive damage. I saw organizations create opportunities for children kept home from school to get out their rage constructively – through art, dance, song, words. I saw my city spit in the face of every single person out there who has claimed shame for Baltimore, who has disgraced Baltimore, who has said it is beyond redemption, who have already etched its tombstone. DESPITE THE CIRCUMSTANCES, I SAW MY CITY RISE. Police brutality exists. Frustration exists. Racism exists. Anger exists. Everything is boiling over. But despite all of that, GOOD exists. Call me foolish, stupid, naive but I believe in a Baltimore that is bigger than the destruction that has played out these past few days. No fear I have for what currently exists exceeds the hope I have for my city. It never will. I am from Baltimore. I am Baltimore. I am that kid who threw a brick at the police. I am that clergyman who pushed people back from the police. I am the mother who pulled her child up out of the street. I am the man on a megaphone screaming that we won’t take this anymore. I am the policeman looking to keep a city safe. I am that “thug” portrayed in the media. I am that educated hope. I am every part of this city because I AM THIS CITY. Unfriend me because I won’t unfriend any of you. I am not afraid of this discussion. I am not afraid of your viewpoints. I am not afraid because there is so much more to fear than the opinions of those who have already condemned me or my city. Maybe, JUST maybe, if I don’t act so quickly to close that line of communication – if we all don’t act so quickly to close that line of communication – then perhaps somewhere along the line at least one person’s mind might begin to think differently. And one person is one more than yesterday. It’s a change, however small. As it stands, I am here. I am strong. I am Baltimore. And I am not dead yet. Contact the author, Scott Murdock, at smurdock84@gmail.com. 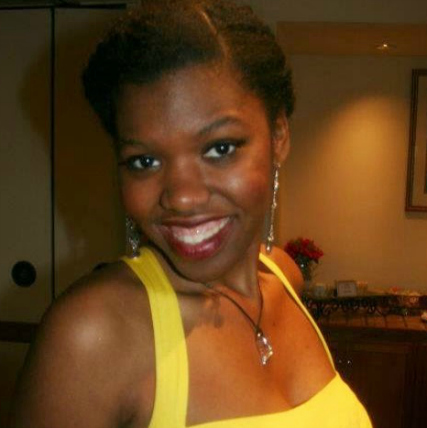 Jazmin Simmons, ’17, Interdisciplinary Studies, is involved with the UMBC for Ferguson organizing effort. A proper thank you and acknowledgment can never be late when you mean it. I want to say thank you to each and every UMBC activist (and now friend) for showing up this past week and standing up for something you believe in. Believing in a cause is one thing. A person can respect that. But when you take action, a person can honor you. We don’t need hashtag names, published books, a political agenda, or dream to become the next Dali Lama, MLK or any other philanthropist. By showing up and sharing your thoughts, you become someone to honor and respect. You may not realize it now, but you are a strong leader in your own way. And I am forever thankful to see everyone come together for a common goal. This is easily one of the most diverse, progressive, honest, strong, dynamic, intelligent, positive groups on campus and we have a lot to prove to our campus. As you may know, this past week was not a one-time deal. Forever, these events will be ingrained within us. And I only hope you will continue to find your passion and do GOOD for your community. What can I do to be a better ally for Baltimore? So here, I present a new challenge to you all. Bring one new person to the UMBC for Ferguson: A Community Activist Teach-in event on Thursday, May 7th (8:00 p.m., Sports Zone, The Commons). This could be a friend, teacher, stranger, or a cardboard cutout of some celebrity. I hope we can answer all of your questions, and prepare everyone to stay active in your community. Again I thank all of you for sharing your big hearts and standing up for what’s right. Contact the author, Jazmin Simmons, at sjazmin1@umbc.edu. 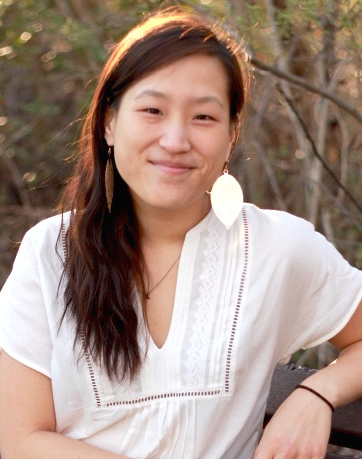 Yoo-Jin Kang, ’15, Language and Cultural Studies & Interdisciplinary Studies, works on the staff of the Women’s Center at UMBC and is a member of the UMBC Women of Color Coalition. Last week was a pivotal and sobering moment for me. Long-standing issues of structural violence and oppression came to a tipping point, and the city of Baltimore was in the national spotlight. What was most amazing for me was seeing before my eyes the clear discrepancy between the actual events occurring in the city, which I learned about through the on-the-ground people posting on Twitter and other social media platforms, and the “events” that national media chose to highlight. It seemed that the lessons from all of my courses about gender, race, media, and the history of structural oppression for communities of color, particularly the black community, were being wrapped together and placed in my lap, and I had to decide whether I was going to accept the burden or sweep it under a rug. What made me the most angry was how quick people were to judge, post, and self-orient. This tendency can be seen through counter-hashtags (reacting to the hashtag #blacklivesmatter) such as #bluelivesmatter, #alllivesmatter, #notallcops, etc. The issue with these counter-hashtags, in my eyes, is not that they are necessarily incorrect. Yes, police lives do matter. Yes, everyone’s life matters, and as my friend, Crystal Ogar pointed out: “Shouldn’t that be obvious?” But the point of the hashtag #blacklivesmatter is that it calls out the directed, systemic elimination of the black community in America through various forms of racism, discrimination, and prejudice. 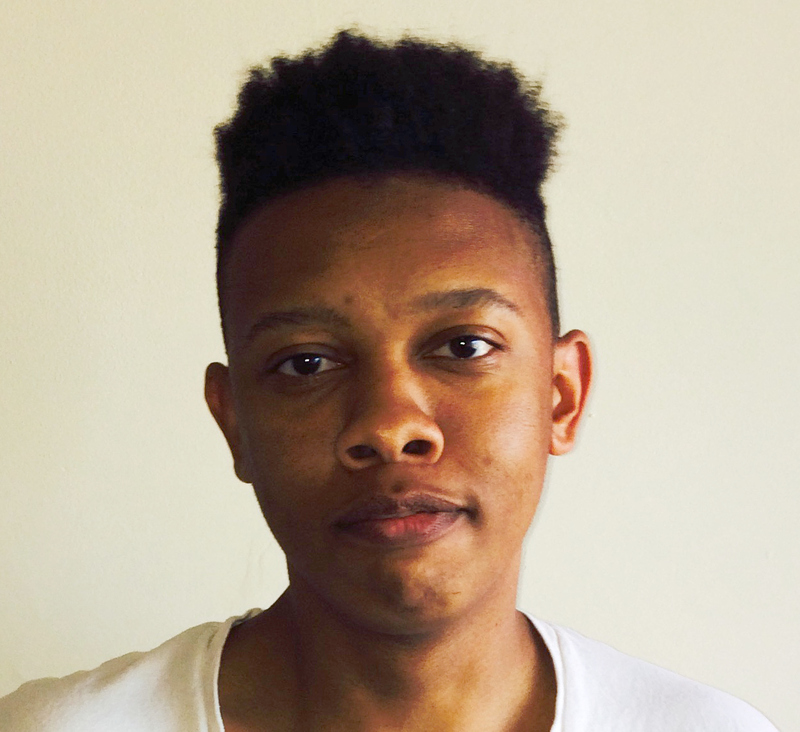 As the Black Lives Matter website states, “When we say Black Lives Matter, we are broadening the conversation around state violence to include all of the ways in which Black people are intentionally left powerless at the hands of the state” and importantly, “The movement also seeks to affirm the lives of Black queer and trans folks, disabled folks, black-undocumented folks, folks with records, women and all Black lives along the gender spectrum. 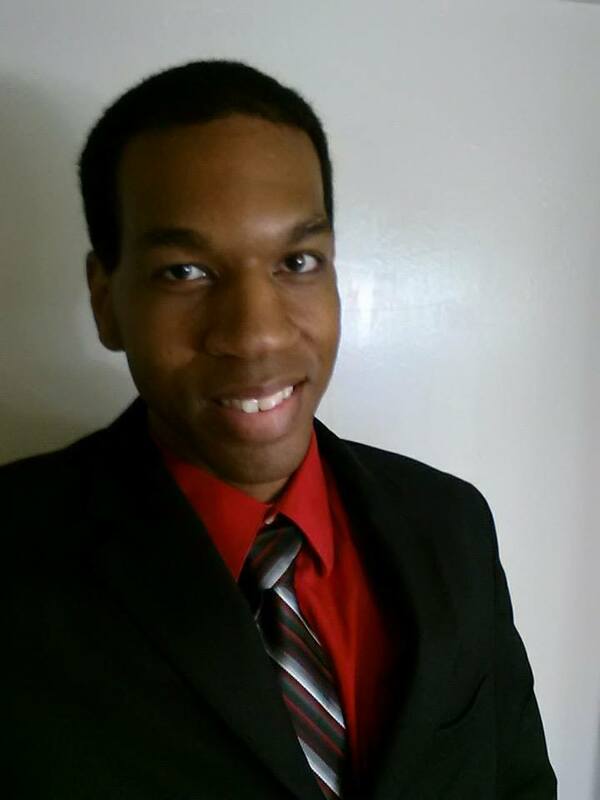 It centers those that have been marginalized within Black liberation movements.” I think this last blurb is so important because while the national media and movement have focused on the deaths of young black males, and with great reason, I hope that we can also allow space to recognize that there are so many more who are affected by this violence beyond the cis-male demographic. The next day, after reflecting with close friends, I joined Kelsey Donnellan and others at march downtown. (Kelsey described our experience in her own post). As a self-identified woman of color and an Asian-American woman, I have felt my fair share of confusion and hesitation about how to support the cause of justice for people whose struggles are different from mine. I know that I must continue to be mindful of when I can step in and when I should step back. George Herbert said: “The Shortest Answer is Doing.” I agree, whether that “doing” is listening, researching, stepping back, or stepping up. Learn more about #BaltimoreUprising at baltimoreuprising.com. Contact the author, Yoo-Jin Kang, at ykang2@umbc.edu. 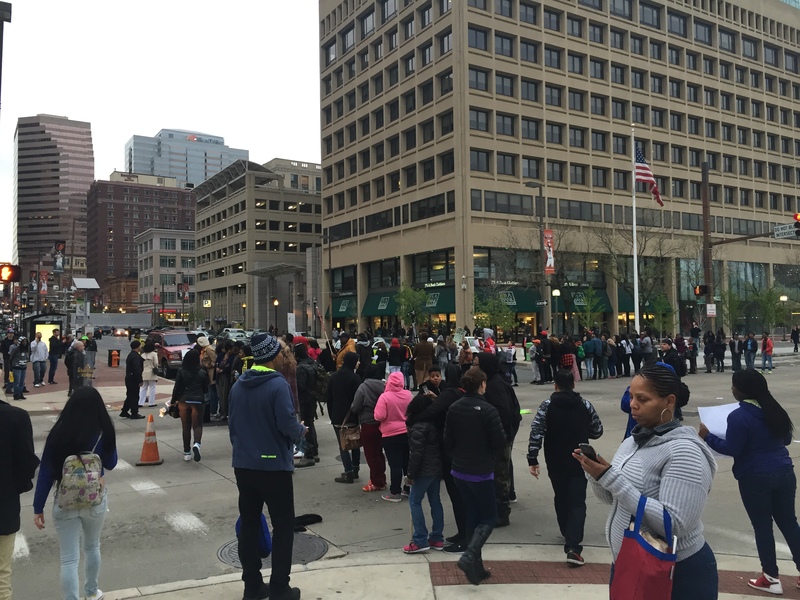 Vanessa Barksdale, ’17, Social Work, participated in protests on Friday, May 1st as part of the Baltimore uprising. And I agree. To casually spit the words “monkey” and “savage” and then turn your back on the actual people living through nightmares you will never see can be one of the most damaging things that anyone ever has the opportunity to do. In doing so, you talk yourself out of the fact that real people are having real experiences with a city that was once their home but is now a police state. There are no words, truly, to describe watching your home become a scene from The Hunger Games or The Purge. There are no words to explain that your favorite mall in the entire city will never be the same. There are no words for watching armymen equipped with long black rifles glare at you while you walk down the road with two other college-aged women. There are no words for describing what it feels like to work up the nerve to ask one of the 50 guardsmen barricading your favorite restaurant when you can come back to eat there, but instead get met with a response so furiously icy that you leave in tears. But most importantly, there are no words to explain how it feels to be a Black woman in a city that promised over and over again how it is for you, but instead meets you with every form of hostility the moment you challenge the notion. Please, don’t assault Baltimore City with your language any further. This isn’t a riot; this is an uprising. 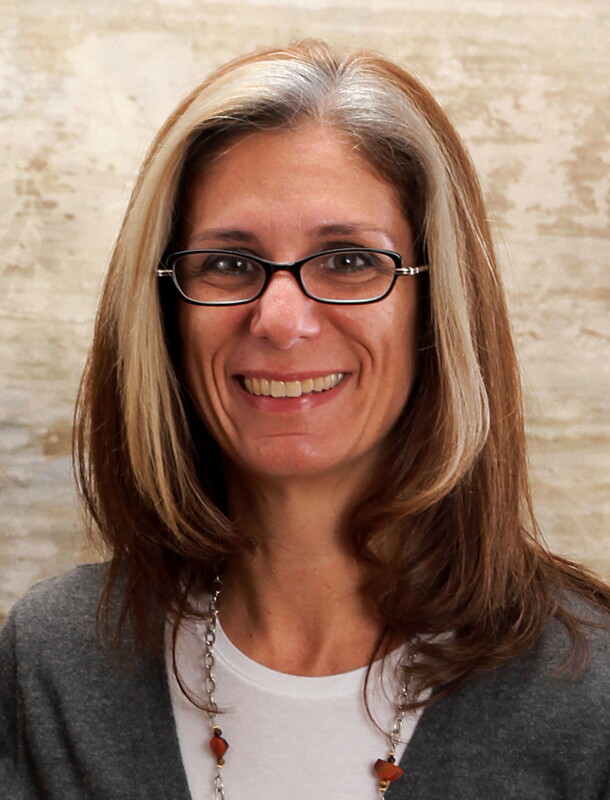 Denise D. Meringolo is an associate professor of history and director of public history at UMBC. Too often in the past, the history of protest and civil unrest was shaped by official accounts. They may capture the perspectives of police officers, government leaders, and even high-ranking activists. However, they inevitably leave out the perspectives of the very people who were directly affected by incidents of injustice, violence, or civil disobedience. These histories are incomplete. And this matters. Historical accounts shape what we think we know about our country, our city, and ourselves. Incomplete accounts create profound misunderstandings about the past that have consequences in the present. More complete stories can help us empathize with one another, recognize systems of inequality, and address pressing social problems. 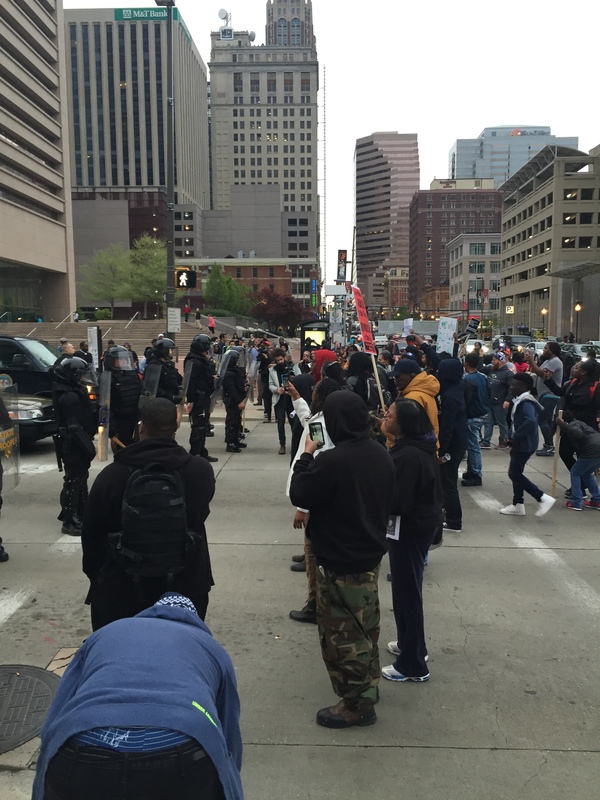 The response in Baltimore to the death of Freddie Gray is complex. On the one hand, it is part of a national trend. Across the country, frustration about police brutality toward African Americans has been growing. 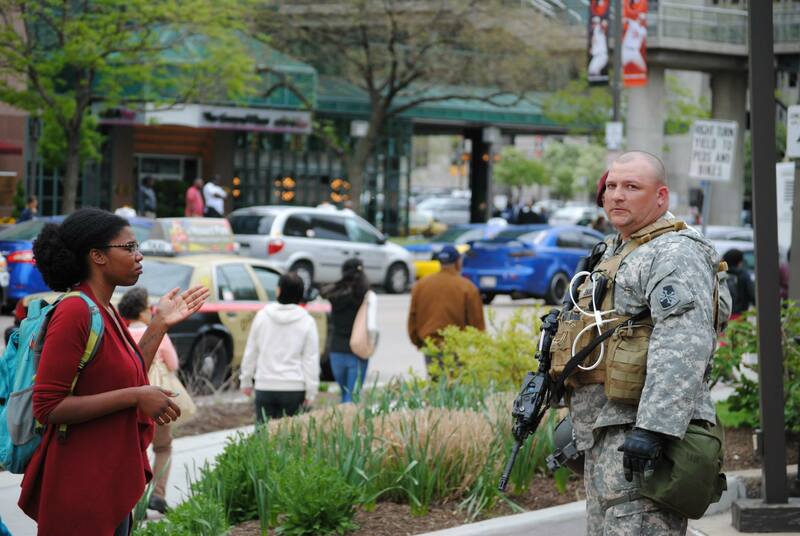 At the same time, the events in Baltimore are local and specific. A long series of political and economic choices, public policies, and social transformations created deep inequalities in our city. We have a responsibility to ensure that a more complete history of these events can be written. Public History students, faculty, and organizations from UMBC and around the city are joining forces to create a digital archive of the Baltimore Uprising. As we gather images, stories, videos, documents, and other materials, we will be able to create digital exhibitions that tell a more complete story about what happened here. Share your stories. Upload photographs. Show us what you’ve seen. Show us the sign you carried. Tell us what you witnessed. When were you there? Where did you stand? Your contributions will build our digital archive. Together, we will make sure the history of the Baltimore Uprising of 2015 can include voices from the streets as well as voices from the halls of government. Contact the author, Denise D. Meringolo, at ddm@umbc.edu. 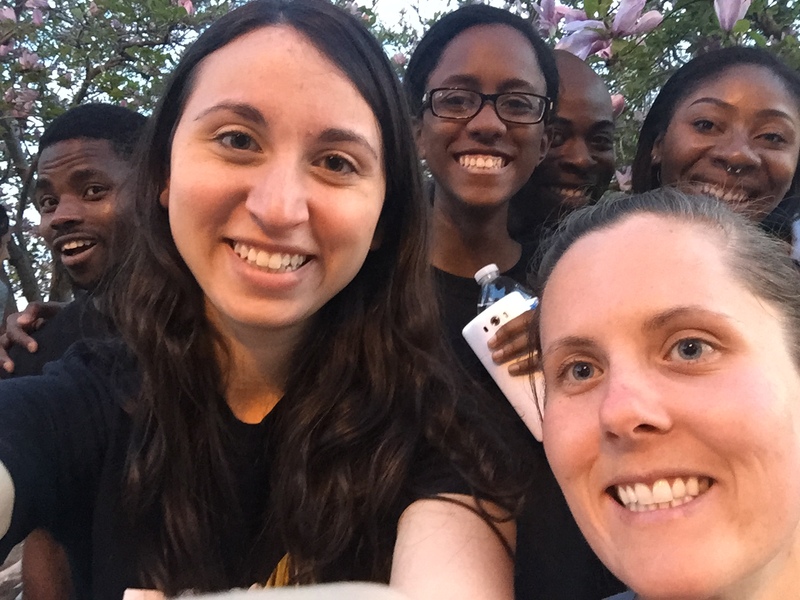 Kelsey Donnellan, ’15, Interdisciplinary Studies (Community Health & Nutrition), has participated in several of the recent actions for justice in Baltimore. 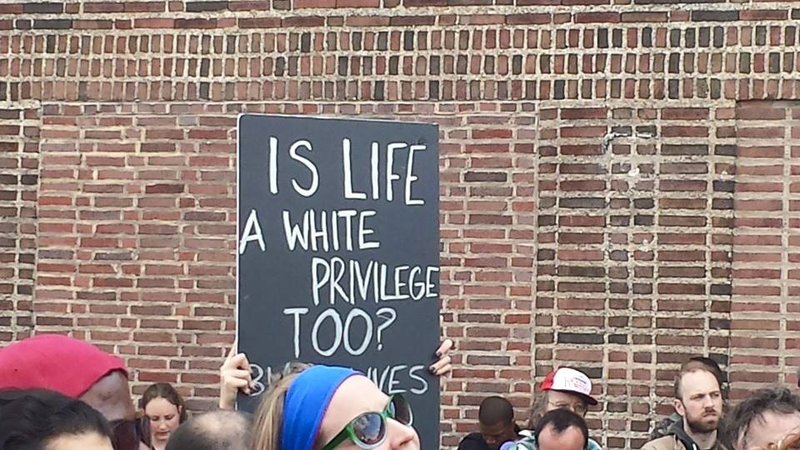 I am prefacing this reflection by recognizing my white, class, and educational privilege. My intent is not to elevate my own voice, but to elevate the community’s voice by sharing what I have witnessed in the city. I would like to start with Wednesday, April 22nd, a seemingly normal day when I cooked with high school students in Baltimore’s Pigtown neighborhood for the Kids in the Kitchen program at Paul’s Place. The social worker there offered me a ride to the UMBC Transit stop, because there had been a shooting up the block the previous night, witnessed by Paul’s Place staff members and school children: a far too common occurrence. Before we reached the bus stop, a group of protesters blocked the way. I got out of the car to join the community in solidarity and silence; to listen to the community’s outcries for justice in Freddie Gray’s death. It was a call for peace, and mourning, and time to heal, on a solemn night. I was next in the city on Saturday for personal reasons, and saw four helicopters circling the city for hours. As my group walked toward the UMBC Transit stop, we saw peaceful protesters blocking traffic at the intersection of Light and Pratt streets, and realized that bus would not be able to reach us. We checked for updates and route changes, but none were posted before the bus turned around and returned to UMBC. We were stuck in the center of a peaceful protest that combined mourning with a call to action from the community. People sang and held hands. Small children stood with their mothers and fathers as I observed from the sidewalk in solidarity while trying to find a way home. We listened to the community’s outcry and felt the emotional support of those gathered together. Then, a woman starts yelling: “Get out your phones, get out your phones, they are coming!” I look over to see the Maryland State Police approaching. 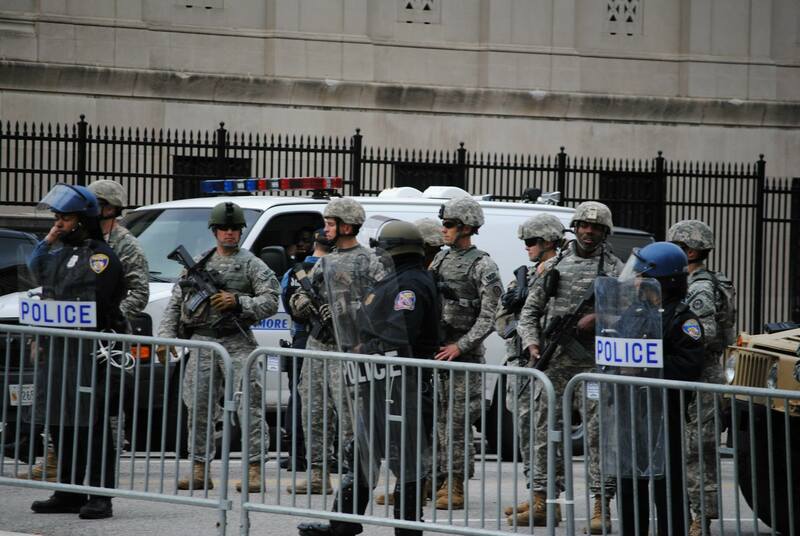 They have come prepared for full-on war, with riot gear, helmets, batons, mace, and guns. The state troopers stand with straight faces and broad shoulders. I feel no emotion from them, only an assertion of power as they widen their stance and the tension grows. My group continues to stand in solidarity with the protesters, and next thing I know, I am face-to-face with a state trooper in full riot gear. The older man next to me starts yelling, “Get the children out!,” and mothers reluctantly pull themselves from the front of the line. My friend Nnamdi and I step in to fill the gap, and now I am a full-on protester. Monday night, back at UMBC, we sat in fear while watching the so-called “Baltimore riots” sensationalized on TV. Someone posted a photo of the view from UMBC’s Albin O. Kuhn Library of the fires downtown. Watching the news and listening to Mayor Rawlings-Blake, I thought: We have it all wrong. The police started this. The community’s anger is a matter of self-defense. If only we would listen, we could hear that in their voices. 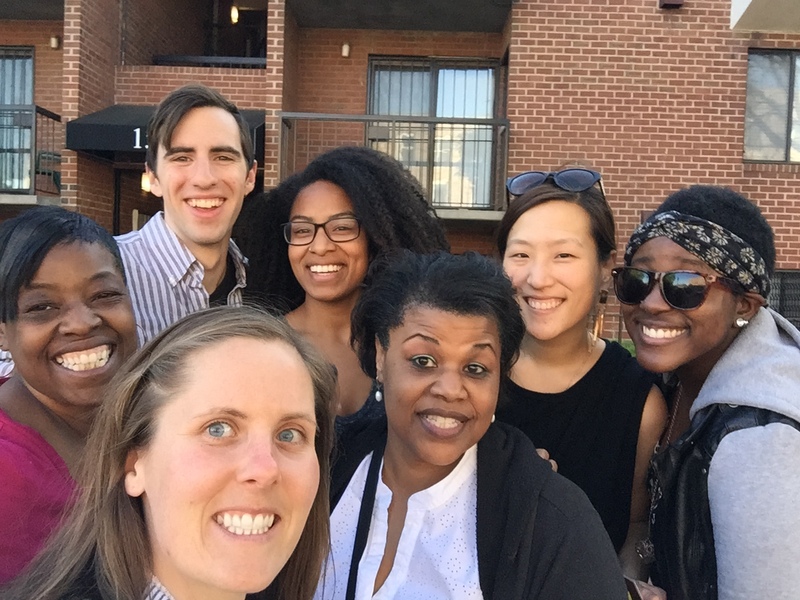 Tuesday, April 28th, I joined four other UMBC students–Yoo-Jin Kang, Crystal Ogar, Norma Nance, and Daniel Heckman–in delivering food and medical supplies to Sandtown. We next drove to the intersection of Pennsylvania and North Avenues–site of a CVS that had burned the previous night–to join a protest. Hundreds of people joined to play music, dance, and sing. There were no police; they did not feel the need to block us in here. It was a large block party. I listened to the community affected by this violence and hate every single day. The residents told their stories and they made a call for intentional action. We did not simply say “the system is broken,” we talked about where the system is broken and why there are human rights violations. I could write a whole blog on this issue itself, so I instead encourage you to read about the chronic inequalities in Baltimore City. After marching for a few blocks, we stopped for a moment of silence at the corner where Freddie Gray had been arrested. Freddie Gray’s cousin joined us to speak for the family, thanking us for being there and reminding us to honor Freddie with peace. He asked asked us to remain calm and focused, because the family was focused on the legal battle about to ensue. We continued to march through the neighborhoods Freddie Gray and his family called home, and the chants rippled down the road as neighbors joined. We were stopped by a line of police in full riot gear, at which point we sang a song and danced. We did not hate the line of police as individuals, but we did hate that they were blocking the road. Who were they protecting? My group continued to march until we needed to turn around and head back to UMBC for a class. We made it a block or two when we ran into two middle-aged women, who stopped us by yelling, “You’re the people! You’re them! You were on TV, and you’re the reason we are here. I am here because of the bravery you showed by being here, and we had to come support.” We told them they were so close to the march and they would be able to catch up soon. We exchanged information and took a picture together. Wednesday, the 29th, I headed back to Baltimore with Nnamdi Edokobi, who just wanted to get his hands dirty by helping cleanup efforts at Mondawmin Mall. 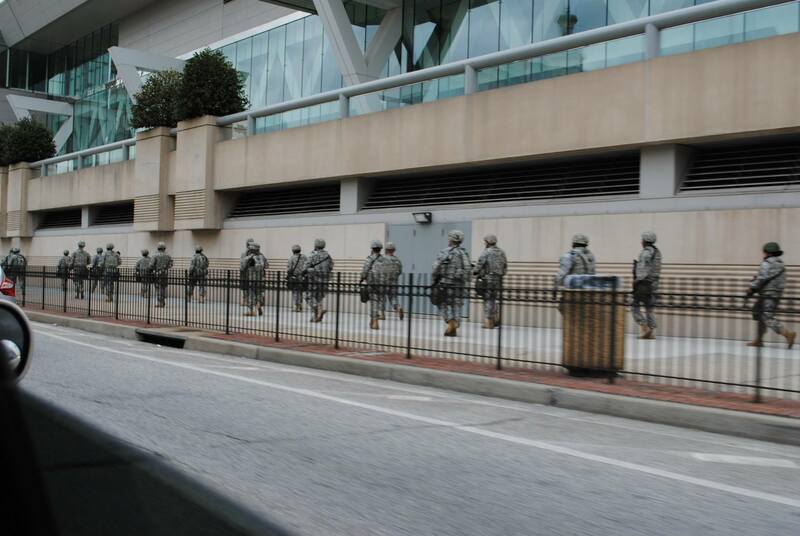 When we arrived it was like a fortress, with the National Guard holding large guns and walking along the mall’s roof. 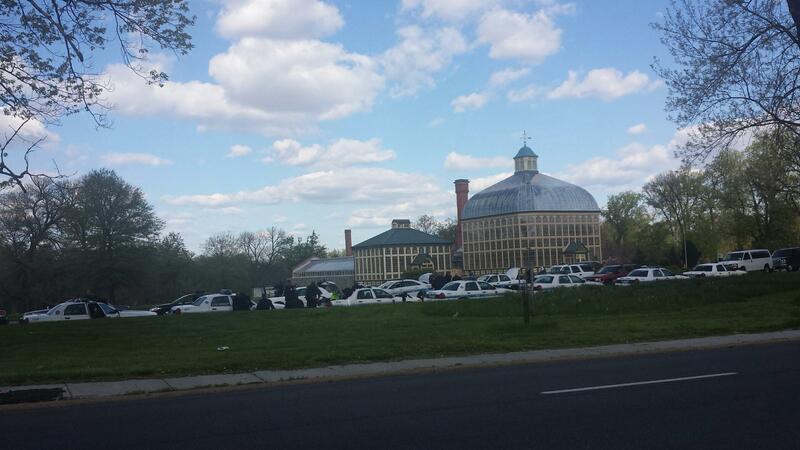 Druid Hill Park, where volunteers had been told to park for the cleanup, was filled with cop cars. The cleanup was cancelled for the night. I was hurt, and again I ask: Who were they protecting? We drove to the intersection of Pennsylvania and North again, and found a smaller gathering than the one the previous night. The CVS had been boarded up. News cameras stood by. Nnamdi and I opted to walk to the other scheduled protest, but we didn’t realize how far we actually were from the event. We walked through Sandtown, where stoop life is every day, wheelies are commonplace, and a community needs to be heard. We walked for 20 minutes, realized we were still far from the protest, turned around and walked back. For many of the community members, life had returned to a relative normal; children played on the streets. But the conversations were all about Freddie Gray and the protests. The community is screaming and crying. What are we doing? What will we be doing a week from now? A month from now? A year from now? When it comes time to vote? I am a transplant to the city, but I’ve never felt a more powerful sense of belonging. I encourage you to get involved it whatever way you can. 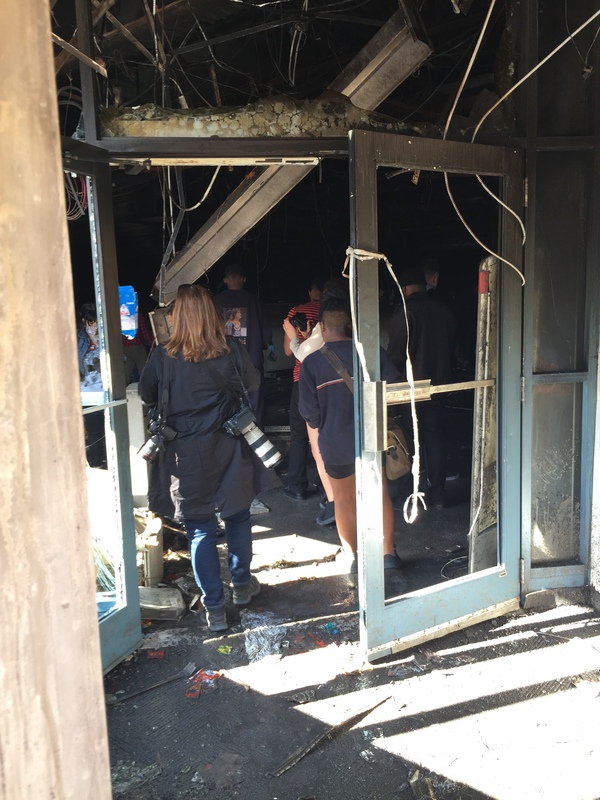 Donate to a small business to help replenish its inventory, clean up where you can, keep up with the events through multiple media outlets, share a photo from someone who is at the protest, join a protest, and most of all listen. Listen with intent. Just Food UMBC will be hosting a food drive for youth living in Baltimore. Vegetables, fruit, and water are in high demand. Students can bring food, toiletries, and feminine products to The Commons, where there will be a box near the Commons Information Center. All donations will be delivered to the Youth Empowered Society (YES), which was damaged during Monday night’s unrest. Richard Elliott, ’17, Political Science and American Studies, participated in Baltimore demonstrations for justice on Friday, May 1, 2015. 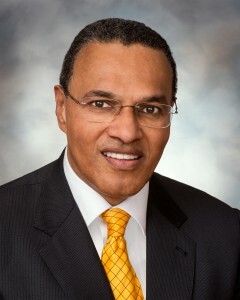 I participated in Friday’s march along with several thousand other people of all colors and walks of life. I’ve never before seen so many friendly, peaceful people who were united in anger towards a common cause. The entire march was about police accountability and an end to police brutality. There were dozens of local people, including kids doing Black Power Fists. The solidarity between many people in cars driving home, honking, dapping people up, and doing fist bumps was beautiful to a degree I couldn’t explain. The protest was entirely peaceful, with several thousand people marching and there not being a SINGLE criminal offense, except for a truck driving over the median. The closest thing I saw to criminal were cars illegally backing up and fleeing as the marchers approached a bridge near MICA. However, the media mostly recorded interviews and footage while walking through a West Baltimore neighborhood where we were crowded together extremely close, the gang members had the strongest presence of any time during the march, and there were people standing on cars. The police at the protest were rather rude. Having their face masks covering their faces, batons out, hands on their guns only gave the impression that they were expecting things to go sour (and this was never a fear of mine as a member of the crowd). Chris Christie sending troopers from New Jersey was totally unnecessary and ALL of the money spent on summoning all of the police and National Guardsman could’ve fixed the pothole-ridden roads we marched on for miles and unboarded homes. Again, there was not a mass of rioters uprooting the city, murdering police and terrorizing the citizens. There were thousands of people, whether gang members, children, puppies, white college students, black high schoolers, whatever, all walking in solidarity for a just cause. Contact the author, Richard Elliott, at elliott8@umbc.edu.